Delicious ingredients. Old World recipes. Our food is a celebration of flavors from Greece and Lebanon. Freshly made each day from healthy and delicious ingredients. Large servings for very reasonable prices. Tastier and healthier than the ordinary fast food meal. 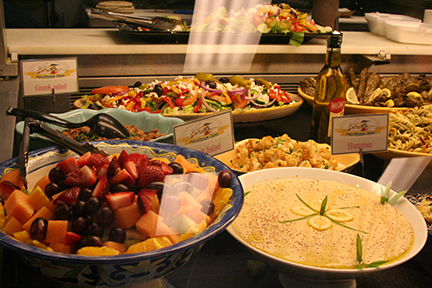 MediTerra's food will tempt you to make the "yummy" sound the entire meal. Heaping servings of delicious food for which you'd expect to pay twice the price. Dine in or take it home to enjoy by candlelight. It's worth it. Parties large and small. Picnics and tailgates. Business meetings and special occasions. Let us do the cooking. And all the clean up, too. Take Your Tastebuds on a Trip Abroad. No Passport Required. Our Flavors Are A World Away, Yet We're Right Across Erwin Road from Duke University's Main Campus. We're Close to Everything Fun in Holly Springs. Greek and Lebanese food with just the right amount of spice. And the perfect Mediterranean flavors for your next party. When your party or event deserves something more interesting than the usual cold sandwiches or overcooked chicken, consider the international flavors of our main courses, sandwiches, salads and sides that will have your guests talking about how delicious the whole affair was. And, of course, don't forget dessert. We can handle groups as few as six to over a hundred with a boxed lunch or sit down dinner. The most difficult part for you will be deciding what not to order from our catering menu. Because everything is so very yummy. Free Delivery in Durham from August 22nd through May 10th within a 5-mile radius and Duke Points on Campus. Pick up only from May 11th through August 23rd. Rewards for frequent guests. Let's become friends on Facebook. Free delivery within a 5-mile radius in Durham only. Duke Points can be used for deliveries on campus. From August 22nd through May 10th. Pick up only May 11th through August 23rd. So have the flavors of the world brought to you! Ask for one of our frequent diner cards. Once you enjoy ten lunches or dinners, you'll get to enjoy your next meal on us (up to $8). It's our way of saying thanks! Become a friend on Facebook or like us on Twitter, and we'll keep you up to date on specials, discounts, and every now and then, the soup of the day!